I was at sleepaway camp one year. The camp had cabin inspections where we needed to tidy up. Right before one of the inspections, and as the inspectors were approaching, a kid dropped his pants and ripped a huge fart in the doorway. When he looked down, he had taken a crap. He picked it up and threw it into the woods. We proceeded to line up immediately for the inspection, with remnants of crap still on his hands. Little time for doodles this week, so squeezed this one out while waiting for the laptop to shut down this afternoon. 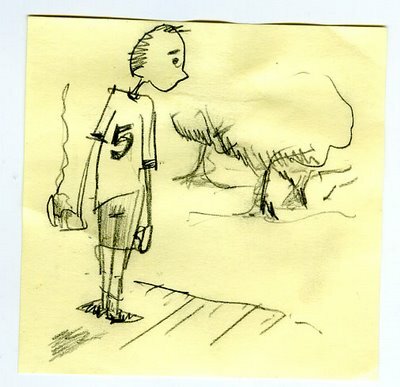 This entry was posted in camp, doodles, poop, requests, smellyfelly, stickynotes, summer. Bookmark the permalink.